From the Bronx to Brooklyn, workers at car washes and fast food joints are finding ways to fight for their rights. Behind this chipper façade, however, the 51st Street McDonald’s is neither friendly nor wholesome, and dreams rarely come true, at least for the phalanx of underpaid workers—by and large Latino and African-American—who struggle to break the golden $7.25 an hour wage ceiling. While McDonald’s profits jumped 135 percent between 2007 and 2011, enough to earn its last CEO $8.75 million a year and its new CEO $13.8 million a year, these workers are forced to survive without benefits, sick leave or a living wage. If this were a typical narrative of low-wage labor—one of the many that unspools daily across New York’s five boroughs—this is where Hall’s story would begin and end: in the blunt grammar of need and struggle. But on November 29, 2012, after months of quiet organizing, Hall and his co-workers decided to rewrite this predictable tale. As part of Fast Food Forward, a new organizing initiative, they joined some 200 workers from across the fast-food spectrum—Burger King, Kentucky Fried Chicken, Domino’s—in a one-day mass strike. Their demands: $15 an hour and the right to join a union. In the annals of low-wage labor, the story of Fast Food Forward is a startling tale, not the least because the November strike was widely believed to be the largest mobilization of fast-food workers in United States history—until that record was broken in April when some 400 workers struck again. But the fast food campaign is also an important part of an emerging New York tale. Despite the profusion of low-wage jobs, grassroots labor campaigns have been few and far between in these parts. Here, as elsewhere, the labor movement has been under attack—from big business, small business and, not the least, the mayor, whose distaste for unions is so strong that he frequently refers to them simply as “special interests.” And here, as elsewhere, unions have struggled to adapt to the changing shape, and face, of the economy. Many simply haven’t bothered. “We don’t have a clear set of practices around how you organize in scattered sites and subcontracted, private sector situations like we’re in,” explained Janice Fine, a political scientist and professor of Labor Studies and Employment Relations at Rutgers University. And yet, throughout the last few years, the ground has been shifting. Taxi workers and domestic workers were among the first to begin agitating, blending inventive union drives with legislative campaigns. And now, others have joined the fray. At carwashes and groceries, airports and fast-food joints—at some of the most feudal work sites in the city—workers have begun banding together, demanding safeguards against the freefall of the low-wage service economy. To be sure, the proportion of workers involved in these campaigns is modest. But the efforts come at a dire moment. As the steady thrum of organized manufacturing has given way to the feeble throb of service work, more and more New Yorkers have been tossed into the grind of low-pay, low-security employment. In 2011, some 600,000 New Yorkers earned less than $10 an hour, a wage that would hardly pays the bills in a less bank-breaking city. Within this underpaid demographic, roughly 42 percent work in retail and food services, while a mix of home health aides, waiters, stock clerks, domestic workers, groundskeepers and others fills in the rest. And the Great Recession merely intensified this trend. Between July 2008 and January 2013, as the city hemorrhaged decent-paying jobs—41,000 middle-wage jobs and 19,000 high-paying ones—the number of low-wage jobs soared by 130,000. This is the unforgiving environment in which the various new organizing efforts have emerged, a bit like water crystals on Mars: not exactly guarantees of future multi-cellular life, but certainly a sign of its possibility. Because the organizing terrain is so tough, many of these efforts have tended to be fairly non-traditional, with community groups joining together with unions to push, pressure and prod by as many means as possible: through union drives, advocacy efforts, policy pushes and law suits. In some instances, sprawling coalitions have joined forces to push significant legislative changes, like the paid sick-leave act, which will guarantee sick leave to more than a million New Yorkers—once, that is, the City Council overrides a likely mayoral veto. The last year has been particularly flush with these kinds of experiments, with as many as five campaigns unfolding across the boroughs. There were successful, if challenging, union drives at five carwashes and a major cable company. The Retail Action Project launched its Just Hours campaign, which attempts to tackle the widespread retailer practice of whittling workers’ hours down to paltry part-time gigs. Airport services workers banded together and, with the support of the Service Employees International Union (SEIU), began advocating for basic labor standards in an industry gutted by low-bid subcontracting. And, of course, fast-food workers went on strike. The carwash campaign, which is being organized under the aegis of Workers Aligned for a Sustainable and Healthy New York (acronym: WASH New York), is among the more instructive of these efforts. WASH New York follows in the path of carwash campaigns in Chicago and Los Angeles, but represents something of a novelty in New York: a multi-pronged partnership between two community groups and a union—Make the Road New York, New York Communities for Change and the Retail, Wholesale and Department Store Union (RWDSU). The three had worked alongside each other before as members of New York’s loose-knit grassroots community, but with WASH NY they made the partnership official—and different. For the community groups, the campaign was a chance to tackle members’ pressing labor concerns, while for the union it was a chance to make serious community connections—with the idea being that, in the process, they would all create something new. “I think that what we decided is rather than seeing ourselves just as a labor movement, we have to see ourselves as the labor component of a broad progressive alliance,” said Stuart Appelbaum, president of RWDSU, explaining the union part of the equation. The decision to focus on carwashes was inspired in part by the groups’ carwash-worker members. “We hear from so many car wash workers, ‘they treat me like an animal,’ ” explained Deborah Axt, co-executive director of Make the Road New York. And, indeed, the carwash industry is a notoriously abusive business, as the New York State Department of Labor documented in a 2008 report. Among the report’s more troubling findings? The revelation that 78 percent of the city’s car wash operators were guilty of violating wage and hour regulations, and that they had shortchanged workers $6.5 million in wages. The Lage Car Wash in SoHo is a textbook example of these kinds of conditions. Sprawled across an open stretch of lower Sixth Avenue, it served for as a kind of landing spot for immigrants, the place they parked their hopes after migrating from El Salvador and other points south. These workers had come, in the words of one, “to live a better life, to have a better salary.” But what they found in the spray of water and slurry of chemicals was brutal bosses, stinging conditions, grueling hours and starvation pay. Salaries started as low as $3.50 an hour and never stretched much past $6. Work weeks yawned past seventy hours. Tips vanished. The cleaning chemicals caused nose bleeds. And when the workers complained, they were told there was no money for raises or protective gear. “They used to tell us, ‘There’s an exit and there’s an entrance, and you know very well where each is located,’ ” said Omar Pineda, 35, a soft-spoken worker from El Salvador who has been spiffing cars for various Lage operations since 2000. Since exiting wasn’t an option, he always stayed. “You need to support your family in whatever way you can,” he said through a translator. This was the world that organizers from WASH New York found when they began showing up at carwashes in 2011, talking to workers one by one. It was not always easy. “People were afraid,” explained Juan Carlos Rivera, 26, who is among the leaders of the SoHo shop. But by March 2012, they had enough momentum to go public. As organizers organized, lawyers sued carwash owners for unpaid wages, and supportive legislators introduced a bill in the City Council to create some measure of accountability in the woefully unregulated carwash world. It was the organizing equivalent of a mixed-media approach. And by September 2012, the campaign scored its first big victory, when carwash workers in Queens voted to join RWDSU. The SoHo workers—or carwasheros, as they’ve become known—followed suit two months later. If the carwash campaign seems like a savvy but uphill attempt at reforming a harsh but relatively small industry, the Fast Food Forward campaign is something else entirely. With as many as 70,000 people working as prep cooks and servers in the New York area, many at fast-food restaurants, fast food is one of the gorillas of low-wage labor. It is vast, poorly paid and splintered—and it’s growing. “We realized that the only way we’re going to make big changes in our neighborhoods and also the New York economy was to really take on some of the bigger players within the low-wage industry, the biggest being the fast-food industry,” said Jonathan Westin, executive director of New York Communities for Change. New York Communities for Change has been one of the leaders of Fast Food Forward, along with SEIU and other groups. To begin tackling this fast-food hydra, Fast Food Forward started sending organizers into the field in early 2011. Along the way, they met workers like Chad Tall, 20, a baritone-voiced Taco Bell employee who is, indeed, very tall. Tall has been working at Taco Bell for the last year, earning $7.75 an hour, and he is treated well, he says. But as so often happens in the fickle fast-food world, his hours were slashed several months back, around the time his mother lost her job, making for very tight times. With no real money left over after helping his family pay for food and rent, he can’t afford to pay for this semester of college and is taking an unwanted break. Tall was skeptical the first time an organizer approached him—“how far is this really going to go?” he wondered—but he’s since become an evangelist, talking to everyone he can about the campaign. Support for the campaign from politicians and other outsiders was one factor, but so were the stories he saw and heard every day—from his mother, who once worked at Duane Reade, alongside a woman they called “Seven Years Seven Dollars”; his brother, who has also spent time in restaurants; his friends; and his colleagues, many of whom are supporting families on fast-food worker salaries. 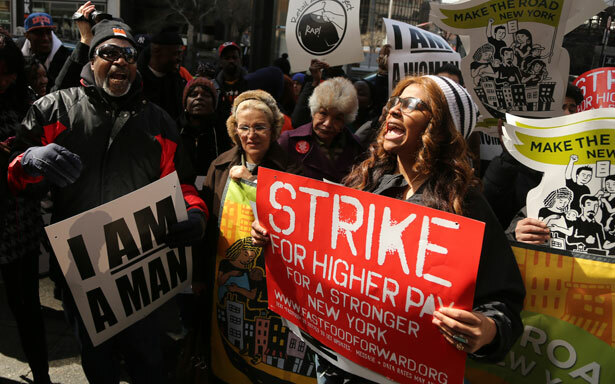 In mid-February, several hundred workers, organizers and labor-boosters came together for a conference called “Workers Rising” about the state of low-wage worker organizing in New York City. The conference was hosted by the Center for Popular Democracy and United New York, which have been providing back-up support for several of the campaigns. At times, it had an almost giddy feel. As workers described their efforts to bring basic standards to their workplaces, academics and labor observers weighed in the meaning of the moment. The New York Times’s Steven Greenhouse, who was moderating a panel, declared it “an unusual time for activism among low-wage workers.” Others offered comparisons to earlier periods in US labor history. Yet even as the crowd cheered such moments, many agreed that big questions and even bigger battles remain. How, for instance, can one-day strikes, hand-delivered petitions and store-by-store union drivers translate into real, industry-wide change? Can these many nascent efforts scale up? And what about retaliation? Bosses are powerful, and a number of workers have already experienced blow-back for their pains. Shortly before the conference, the nineteen carwasheros from the SoHo carwash were informed that they were losing their jobs. The reason, they were told, was that the owner, John Lage, had sold the carwash. Lage claimed he had negotiated the sale the previous June, but the timing of the closing, just a few months after the workers’ vote to unionize and before contract negotiations could begin, seemed suspicious. The fact that he didn’t bother to notify the workers until three weeks before the closing simply seemed cruel. In the immediate aftermath, the closing of the SoHo carwash seemed like a bitter rebuke. But then something unusual happened. As the workers protested their firing, New York State Attorney General Eric Schneiderman, who was already investigating Lage for other possible labor law violations, stepped in and negotiated an agreement with Lage on behalf of the workers. The company had to transfer the carwasheros to new positions at other Lage sites within thirty days or else face significant monetary penalties. The world’s largest employer is under fire for subcontractor abuses in Nicaragua and Bangladesh. Read Josh Eidelson’s report. Read all of the articles in The Nation’s special issue on New York City.